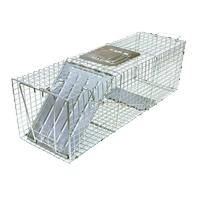 Professional Live Animal Cage Trap. Spring Loaded Single Door, Built of Heavy Gauge, Tempered, Galvanized Steel Wire, Pre-assembled. Packed 1 per Case with Instructions. 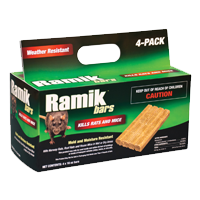 Available in: Several sizes for large and small pest animals. When mice enter the trap, they trip a sensitive mechanism which prevents them from escaping. 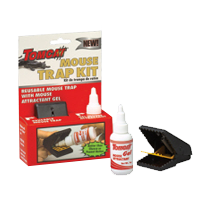 The trap holds up to 10 mice at a time and the tinted lid makes it easy to monitor mouse activity. Boothill contains bromadiolone, a single-feed 2nd generation anticoagulant trusted and used for more than three decades. 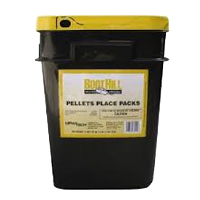 Boothill is a highly palatable rodenticide with a long history of proven efficacy. It is recommended to change the chemistry (type of ingredients: difethialone, bromadiolone) and format (pellets, mini-blocks,etc.) to excite rodent’s appetite. Alterning chemistry and format is the best way to prevent bait shyness and to improve bait acceptance during the rodent’s life cycle. Available in several sized bars/packages.